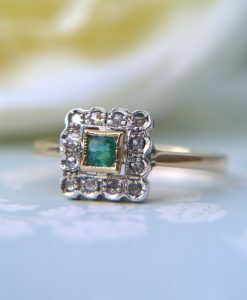 Browse our selection of fine gold rings in a multitude of styles and set with a huge variety of beautiful gemstones. 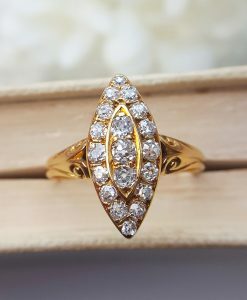 Shop for antique diamond rings, vintage reproduction rings, Art Deco diamond rings, eternity & half eternity rings, engagement rings, big bold dress & cocktail rings and diamond cluster rings. All will arrive fast and free and beautifully wrapped. 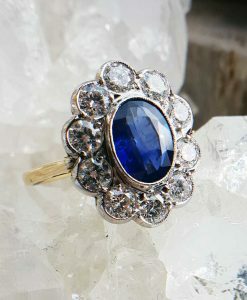 Assay Assured online jewellery registered with the British Jewellers Association. 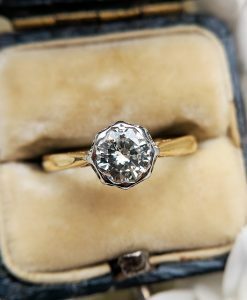 Buy your diamond ring with confidence! 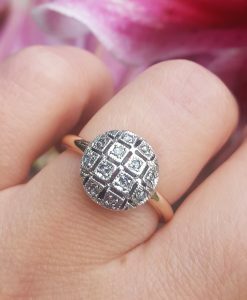 Rings are our absolute favourite item of jewellery here at Chains of Gold. 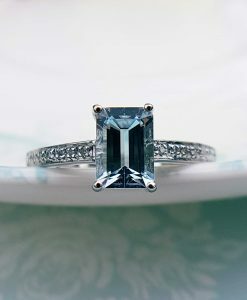 They are an absolute joy to source, photograph and sell. 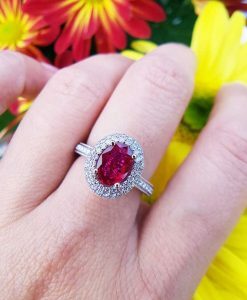 There is so much meaning when it comes to rings: the gemstone(s) chosen for each piece, the number of stones and their layout all contribute to a fascinating and heart-felt message to the recipient. 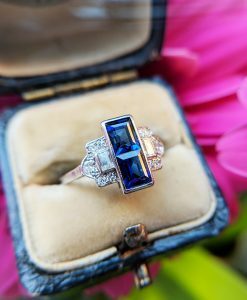 For example, did you know that three stone rings, be they diamonds, sapphires or rubies, represent the past, the present and the future? 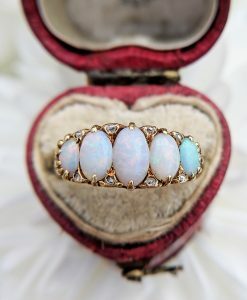 And when stones are presented within overlapping bands, this is to represent the intertwining of two souls. So romantic and so much to think about! 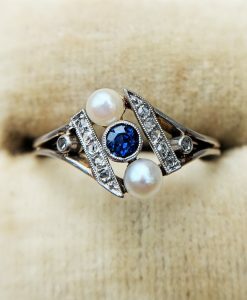 When you purchase a ring from us, we will be happy to guide you as to its meaning, please just ask. 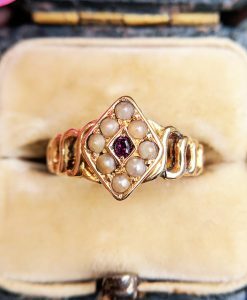 You can buy both modern and vintage rings in our shop, and all are of wonderful quality, with beautiful gemstones to suit your taste and need. 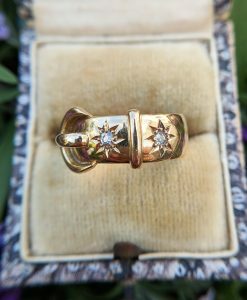 Where rings are listed as 'new reproduction' rather than vintage, note that these pieces are handmade for us with incredible skill. 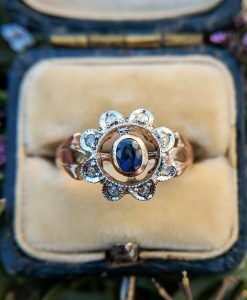 All of our designs are modelled on old pieces of jewellery and are made by master craftsmen in Italy. 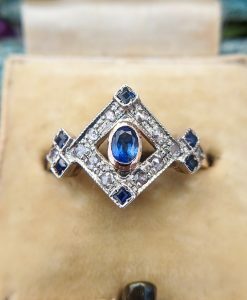 Stones are cut in the old style and are set in silver, just as they would have been when originally made. The shank will always be fashioned from fine, 9ct gold. Sometimes rose gold, sometimes yellow gold. 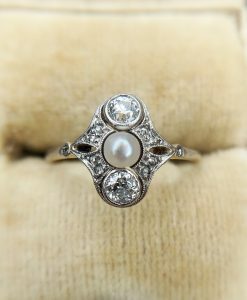 We stock beautiful engagement rings with diamond, morganite, sapphire, ruby and a whole host of other stones. 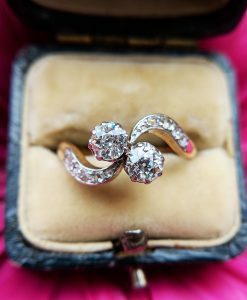 And of course, engagement rings are not limited to a single solitaire stone. 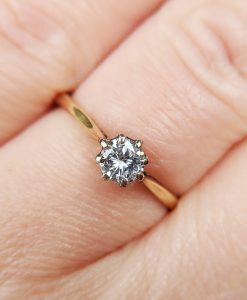 Solitaire engagement rings are a rather modern custom, so don't be afraid to purchase something completely different for the love of your life. You know her style and taste, and anything you present with love will surely be well received. 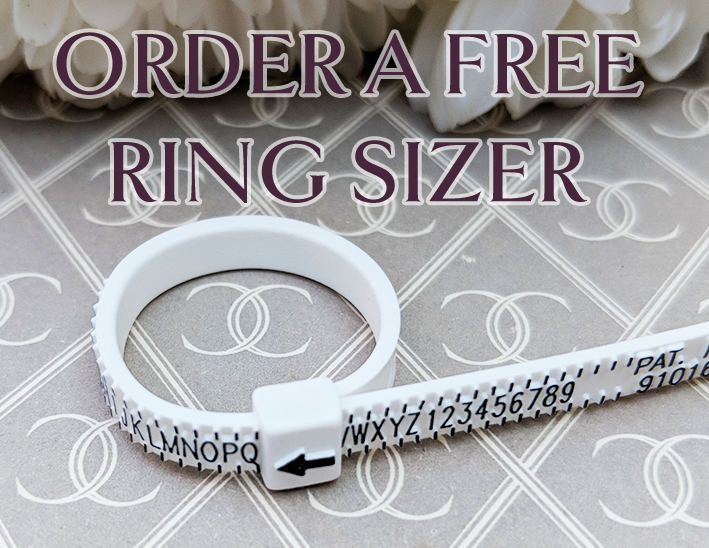 We are always on-hand to offer tailored advice, just give us call on 01793 340086 and note that we can size the vast majority of our rings to your finger. 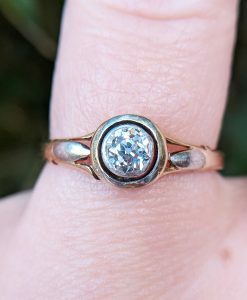 Where there are exceptions we will have specified and why (usually because the ring is very old and delicate). 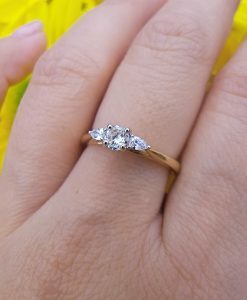 All of our modern and vintage rings are delivered worldwide, free of charge and provided the ring has been resized, you can return within 30 days for a full refund should you decide this is not the ring for you.